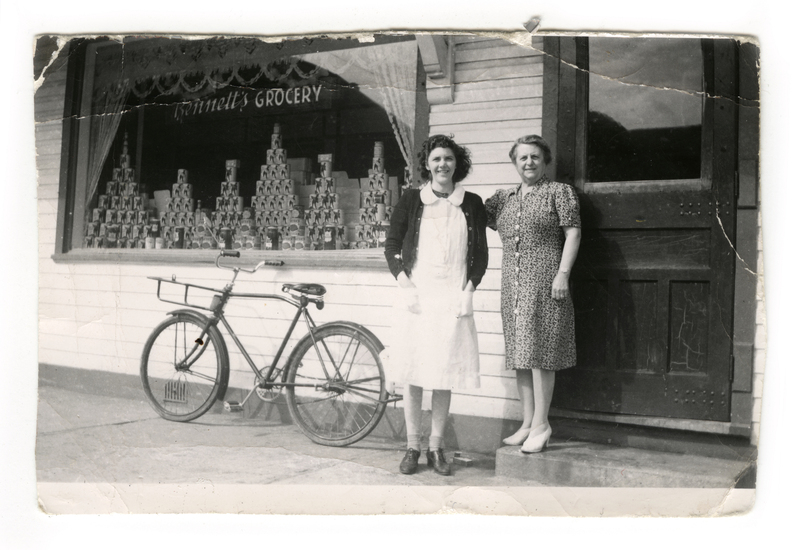 I remember my grandfather [Hugh] Bennett, he worked at McGowan Cigar Factory, he was the manager down there… at Market Square… and then he and Uncle George decided to build a store, and they started there in 1925… so I remember Grandpa. He worked in the store, and they had a little cage there for him where he took the money, and we would go down to the store and we weren’t allowed to ask for an ice cream cone unless they offered us one. My grandmother [Annjane] Bennett was an Abernethy. Granny was a beautiful looking woman, beautiful brown eyes, and very generous. My grandfather Bennett used to say when he came in for a bowl of soup all he got was water and onions because she gave it all away. A beautiful baker, made beautiful apple pies and carrot cake with chocolate icing on it. When we went to the home and school club, the teachers would say, we’ll buy this cake! George took two vacations in his life, and worked virtually eighty years at a grocery store. First time he had friends of his convince him to go to Hawaii. So he flew to Hawaii, and he got off a plane, and he went to a phone, and phoned my dad, and wanted my dad to adjust the price of potatoes by two cents. 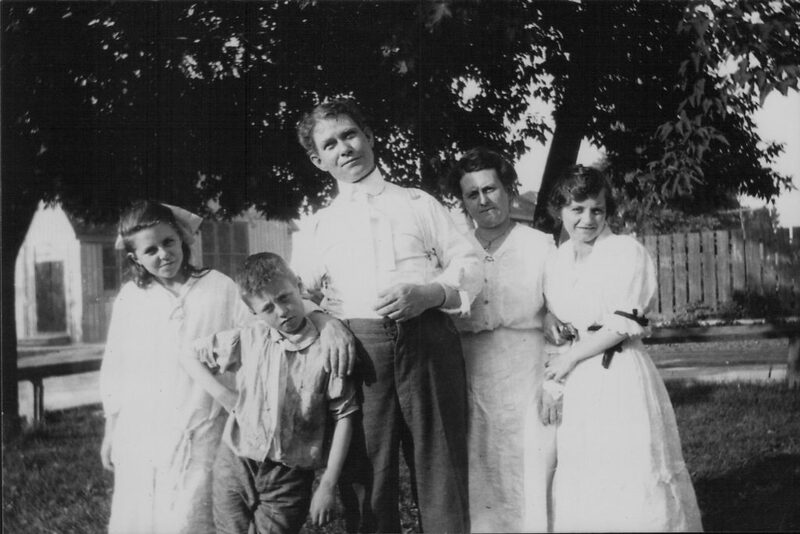 Since George and his wife Alice had no children (see here for that story), he passed the business to Cecil’s son, Hugh. Hugh’s son Dave was the last to manage the store; Dave Bennett now runs a No Frills on the east side of the river. 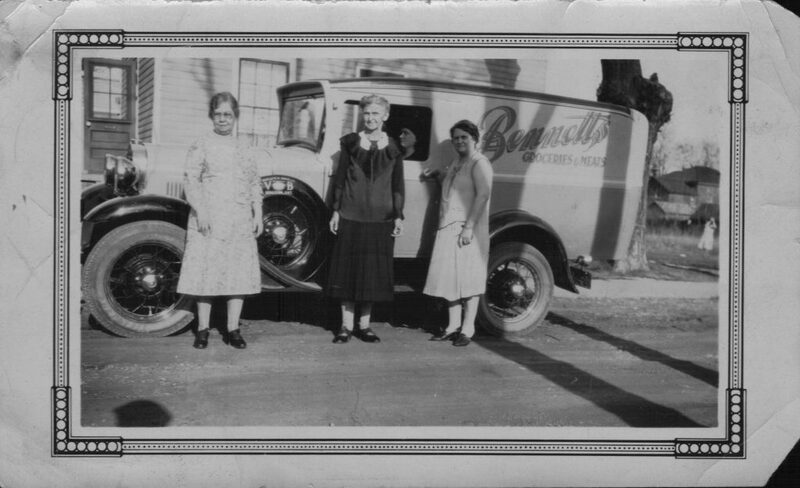 Bennett’s existed from 1925 to 2009 (after the 90s, it was a No Frills), operating under various slogans — for example, “Where Food Buying is Most Satisfactory,” “Always Changing,” and “The Home of Red Brand Beef.” It started out as a corner grocery like all the others, but over the years it morphed into that new phenomenon, the supermarket. As Bob Martin remembers — his mother was also a Bennett — George would bring in boxcars of turkeys as loss leaders at Christmas. Garth Amey remembers the wide aisles and flourescent lights. Over the years Bennett’s, with its parking lots and warehouse, came to occupy the equivalent of a city block on both sides of Bagot Street between Charles and Dufferin. As Gary Bennett puts it, “when you were young and growing up in the Swamp Ward you either delivered newspapers for the Whig Standard, or if you were really lucky, you got a job at Bennett’s bagging groceries.” Bruce Downey called it the “City Hall” of the Swamp Ward: people of all sorts met in the aisles of Bennett’s. 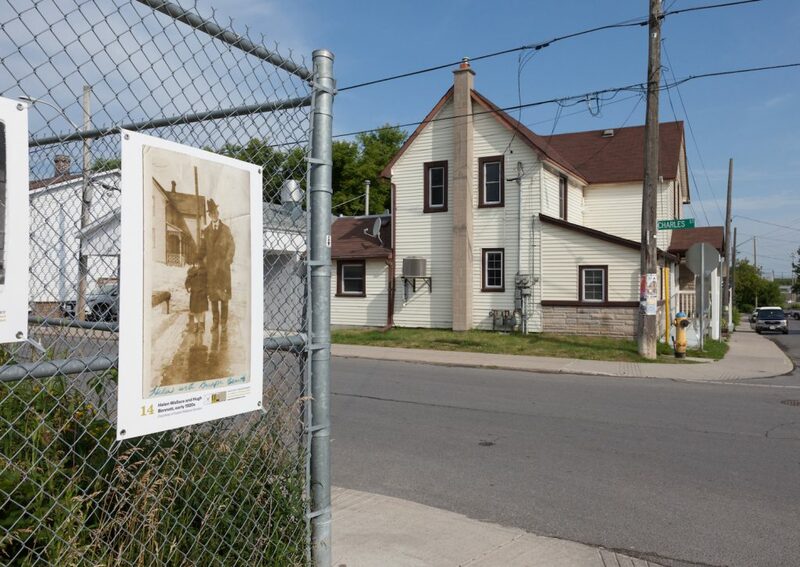 Its shopping carts were to be found all over the neighbourhood, used by those without cars to transport everything from beer empties to televisions and armchairs. Susan Anderson even did an art project about them. The worst was ten pound bags of potatoes … it was all done by hand, so you’d have like a chain gang, where one guy would throw a bag of potatoes to you, and then you’d throw it to somebody else and somebody else, and hot in the summer months, I mean those railcars where just unbelievable warm in the summer. Once you got to the end of the railcar, the ten pound bags, the next four rows would be the fifty pound bags, and the only way to get them was you got to slug them to your shoulder, and walk them through the railcar and out to the truck, and put them on the truck, and someone would load them on the truck. I mean, the handling of product back then was just crazy, but back then people were paid a lot less, so if you did the volume, and you could support it, and for everyone it was a job. Ultimately, the scaling up of the industry and its distribution systems made it unsustainable to run the store on a small urban street. Nowadays, as Gary puts it, the grocery business is vertically integrated: ““they own the river where the salmon comes from, they own the company that cans the salmon, they own the company that ships it to you – they own the whole supply chain.” Only enormous stores can generate the volume to offer low prices. 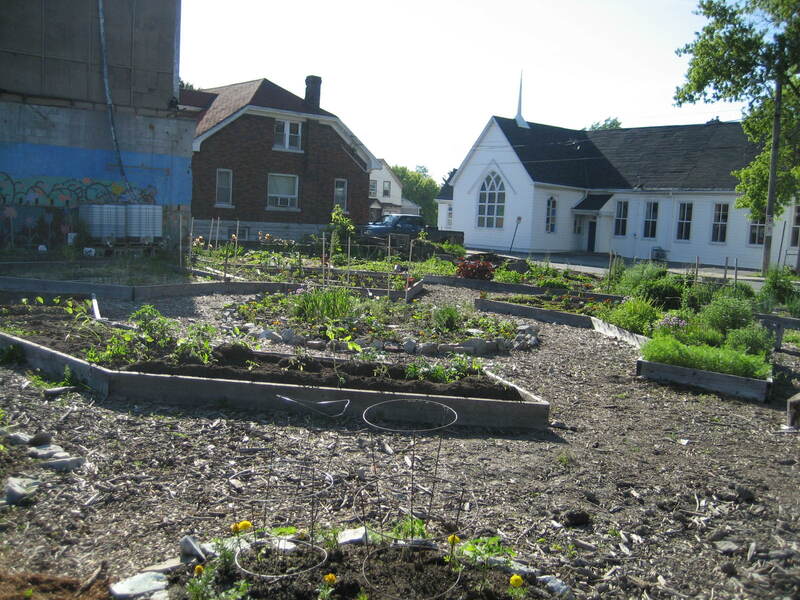 It is unlikely the Swamp Ward will have its own grocery store in the future, but perhaps the vacant land at the corner of Bagot and Charles will have a new life that will meet community needs and foster community relationships. For an audio documentary about Bennett’s, see here; also see its companion blog post. 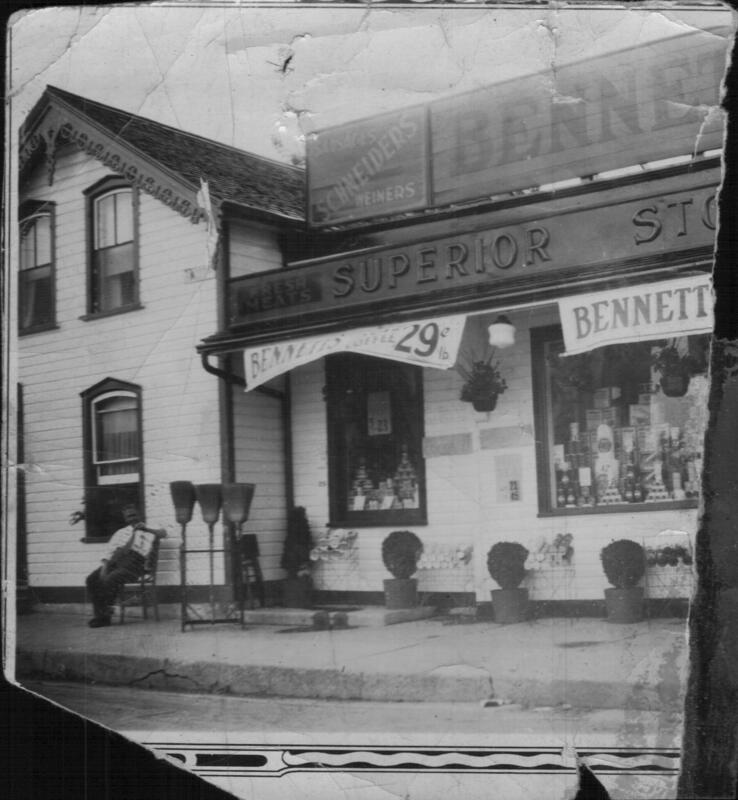 Warm thanks to Bob Martin, Isobel Wallace Gordon, Kevin Blaney, Annmarie Blaney-Clarke, Gary Bennett, Susan Anderson, Bruce Downey, Garth Amey, and several others for stories about Bennett’s. Photos are from Isobel Wallace Gordon, granddaughter of Hugh and Annjane Bennett and sister of Helen Wallace. Helen Wallace and her grandfather Hugh Bennett, as displayed in situ June 2018. Credit: Chris Miner. 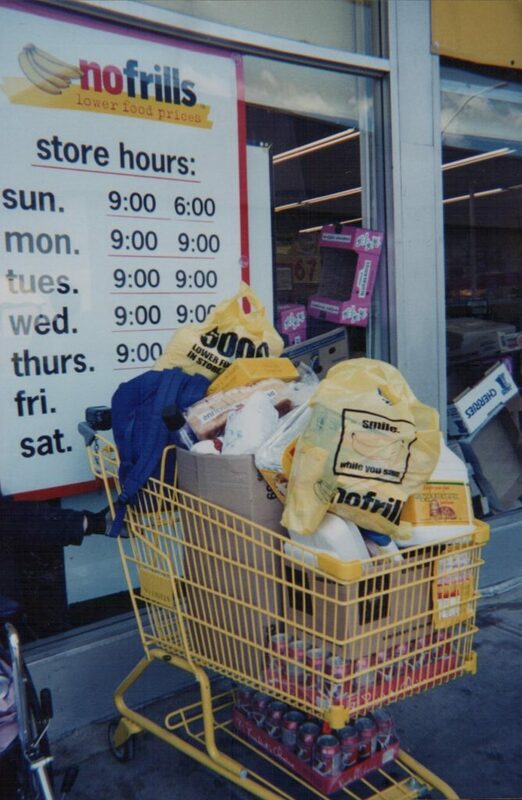 A shopping cart in front of Bennett’s, 2001. Credit: Susan Anderson.